Hours Steady of Filming: The rechargeable gimbal's motor provides 4 hours of smooth filming from a single 3-hour charge. The unit charges using a provided Micro-USB cable to charge your gimbal from almost anywhere. The Pan, Tilt, and Roll Motors offer unlimited 320° rotation for free-hand filming and photography and vertical and panoramic shooting. You can also lock the gimbal's position at any time, and double-pressing the Power Button resets the smartphone to the center position. Multiple Shooting Modes: The SteadyGo Gimbal features a brushless motor and has the ability to operate in three professional shooting modes: Following Mode, Locking Mode, and Pan Following Mode. The gimbal's familiar joystick controller offers smooth Up/Down and Left/Right movement to adjust the desired pitch, roll, and yaw settings on the gimbal's three axes. Remote App Connection: Using the SteadyGo App lets you film using the gimbal's full functionality, including the options to record, switch quickly amid camera modes, and toggle between front and rear cameras. It also provides a variety of filter styles for different scenes and effects and enables advanced features like Facial Detection. 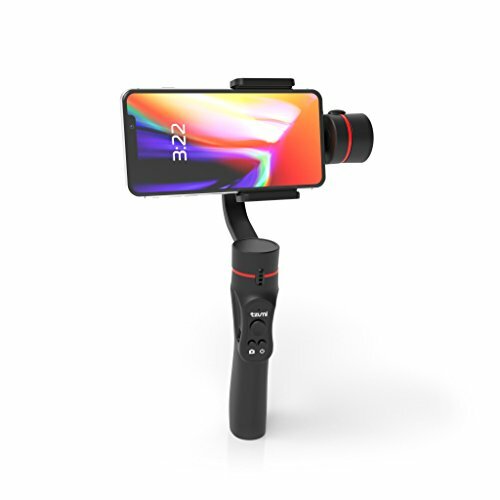 The gimbal allows for Bluetooth-connected camera operation using the free app, which is available for download at both the App Store and Google Play Store.